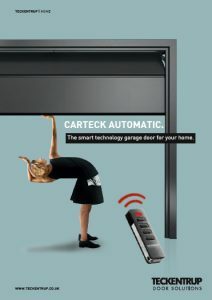 Teckentrup automatic door. Padfield, Glossop. 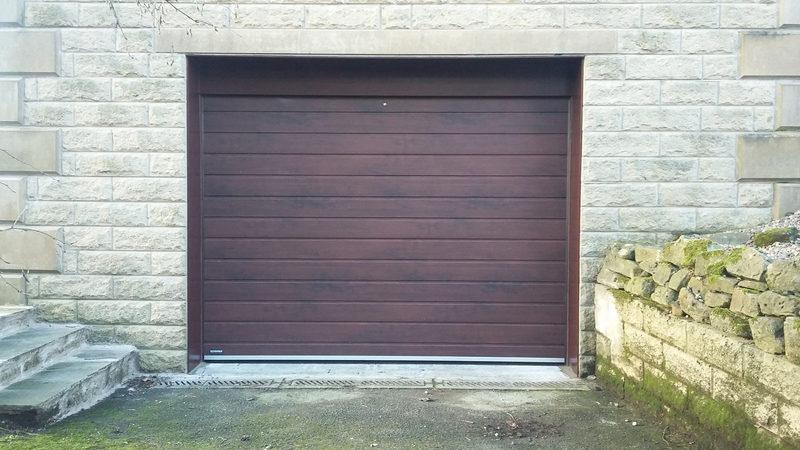 A recent installation of a Teckentrup, automatic sectional garage door, in a ribbed style and rosewood colour, chosen to match other features on the house, which is in the lovely scenic area of Padfield. The old door that was replaced was a manual door that had become quite unusable. After safely removing the old door. We could start to remove the old timber frame and clean up the stonework ready for the new door. The new sectional door has its own steel frame and tracks, which are the first part of the door to be installed along with the spring system. Teckentrup doors use multiple springs to balance the door, this is so that the load is spread and the springs don’t take as much wear and tear as the springs on some older type doors do. The panels are loaded into place lastly and connected to the spring system. Sectional doors consist of four panels that are hinged. 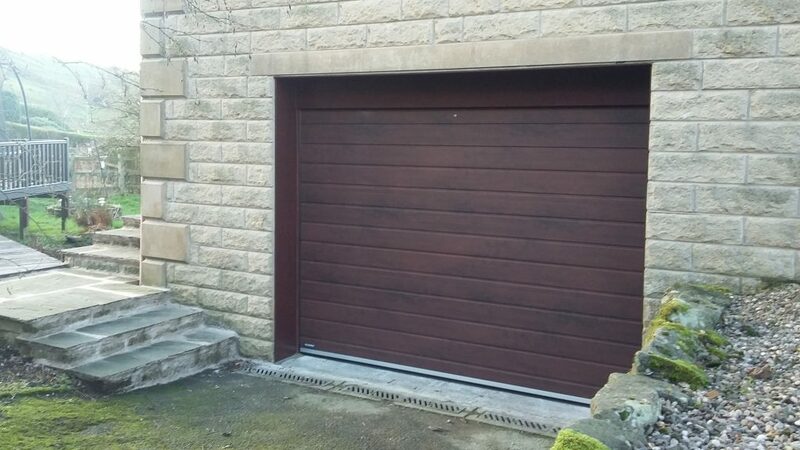 The door opens vertically and then back into the garage via its track system. This means there is no kick out on the door and vehicles can be parked right up to it. 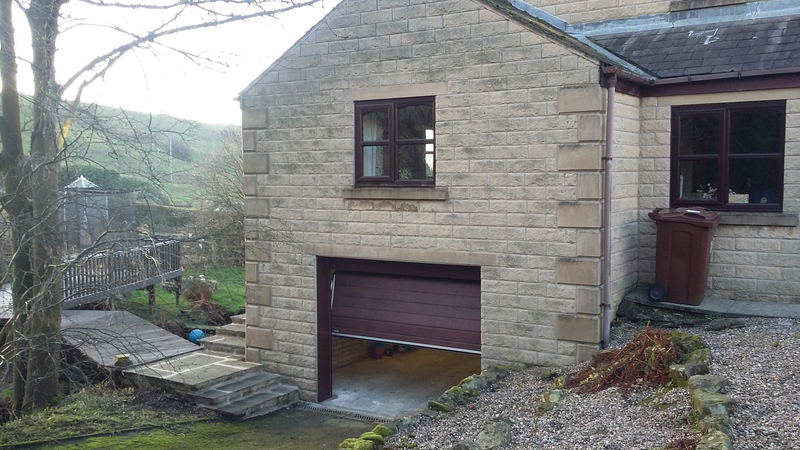 We finally finished the job off by using rosewood uPVC fascia board to box the job in neatly and cover up where the old timber frame had been. This door will be much easier for the customer to use than the old door, by simply pressing a button. The door is also very well insulated and highly secure. 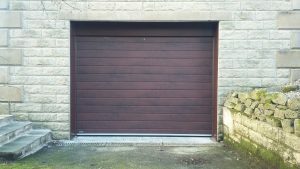 We rate sectional doors as the best on the market for these reasons. If you’d like more information on the many styles and colours available, feel free to browse the Teckentrup brochure, or contact us to arrange a free survey.